“After these two angels were gone out of my sight, I saw a certain garden on my right hand, in which were olive trees, vines, fig trees, laurels, and palm trees, planted in order, according to correspondence. I looked into the garden, and saw angels and spirits walking and conversing together among the trees; and then a certain angelic spirit observed me. They are called angelic spirits, who in the world of spirits are prepared for heaven, and afterwards become angels. That spirit came out of the garden towards me, and said, "Will you come with me into our paradise, and you shall hear and see wonderful things." And I went with him, and then he said to me, "Those whom you see (for there were many) are all in the affection of truth, and thence in the light of wisdom. Here also is a building which we call the TEMPLE OF WISDOM; but no one sees it who believes himself very wise, much less he who believes himself wise enough, and still less he who believes himself wise from himself; the reason is, because such persons are not in the reception of the light of heaven from the affection of genuine wisdom. Genuine wisdom consists in a man's seeing from the light of heaven, that the things which he knows, understands, and is wise in, are so little respectively to what he does not know, understand, and is wise in, as a drop to the ocean, consequently scarcely anything. Everyone who is in this paradisal garden, and acknowledges in himself from perception and sight that his own wisdom is so little comparatively, sees that temple of wisdom, for interior light enables him to see it, but not exterior light without it." And because I had often thought this, both from science, and then from perception, and lastly from seeing it from interior light, and had acknowledged that man had so little wisdom, behold, it was given me to see that temple. As to form it was wonderful. It was elevated above the ground, quadrangular, with walls of crystal, its roof of translucent jasper elegantly arched; the foundation consisted of precious stones of various kinds. The steps leading up to it were of polished alabaster. At the sides of the steps appeared figures of lions with their whelps. And I then asked whether it was allowed to enter; and it was said that it was allowed; therefore I ascended, and when I entered, I saw, as it were, cherubs flying beneath the roof, and presently vanishing out of sight; the floor upon which we walked was of cedar, and the whole temple, from the pellucidity of its roof and walls, seemed in the form of light. 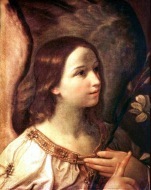 The angelic spirit entered with me, to whom I related what I heard from the two angels concerning love and wisdom, as also concerning charity and faith. And he then said, "Did they not speak of a third also?" I said, "What third?" 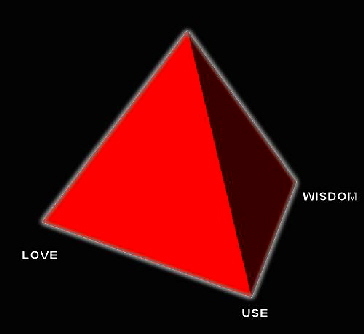 He replied, "It is Use: love and wisdom without use are not anything: they are only ideal entities; nor do they become real before they are in use: for love, wisdom, and use, are three things which cannot be separated. If they are separated, neither is anything. Love is not anything without wisdom, but in wisdom it is formed for something. This something for which it is formed, is use. Therefore, when love through wisdom is in use, it is then something; yea, it then first exists. They are altogether as the end, the cause, and the effect. The end is not anything, unless through the cause it is in the effect. If one of the three is loosed, the whole is loosed, and becomes as nothing. It is similar with charity, faith, and works. Charity without faith is not anything; nor faith without charity; nor charity and faith without works; but in works they become something, of a quality according to the use of the works. It is similar with affection, thought, and operation; and it is similar with will, understanding, and action. That it is so may be seen clearly in this temple, because the light in which we are here is light that enlightens the interiors of the mind. That there is not given a complete and perfect thing unless it is a trine, geometry also teaches; for a line is not anything, unless it becomes an area; and an area is not anything, unless it becomes a solid; therefore the one must be produced into the other, that they may exist; and they co-exist in the third. As it is in this, so it is in each and every created thing; they are terminated in their third. Hence now it is, that three in the Word, spiritually understood, signifies complete and altogether. Since it is so, I could not but wonder, that some profess faith alone, some charity alone, some works alone; when yet the first without the second, and the first and second without the third, are not anything."